Over the last decade, digital technology has become the norm in X-ray departments at hospitals and other medical imaging facilities. Most understand the value of CR, direct DR, or a combination of both in making the transition from an analog to a digital environment. 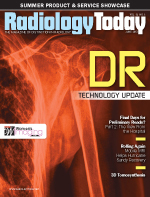 While both digital techniques are widely used, DR has become the preferred choice of most in the hospital radiology environment because of its improved image quality, workflows, and dose reduction. According to industry insiders interviewed for this article, the current buzz in DR is on mobile digital X-ray systems and dose management. Offering a seamless workflow in these cases when it is not safe or practical to move a patient from his or her bed to the radiology unit lately has been a focus of equipment manufacturers. Meanwhile, hospitals have begun preparing for new or anticipated dose reduction and monitoring regulations that began with the CT industry and pediatric task groups. Some hospitals reportedly are beginning to justify budget approvals based on quantifying the new technologies’ ability to lower dose. Robert Fabrizio, director of marketing and product development for digital X-ray for Fujifilm Medical Systems USA, says the company’s reenergized focus on dose and image quality has led to the development of new innovations in detector technologies. That includes the company’s patented ISS capture technology, its latest dynamic visualization image processing, and other detector advancements that utilize engineering to realize dose savings and enhance image quality. X-ray manufacturers say the industry is developing international standards that would be accepted globally from one manufacturer to the next so that radiologists in different countries could all calculate dose in the same way and keep track of the total dose amount that patients receive in their lifetimes. Frans Venker, global marketing lead for diagnostic X-ray for Philips Healthcare, sees two current trends in the DR sector: ongoing digitization of radiography because of the inherent workflow advantages of DR, and making X-ray mobile and providing bedside digital X-ray solutions. Another trend is DR becoming widely available beyond the “premium” radiography room space because of the introduction of more quality DR systems at lower price points. Beyond dose issues, most customers’ checklist of needs focus on three points: extremely reliable direct DR solutions, flat-panel detectors providing excellent image quality, and systems with flexible usability. Of course, this all must come at an affordable price point. Wireless battery charging is yet another customer request, but that hasn’t yet come to fruition. While further advancements may be made regarding battery life, this is not something manufacturers see as feasible in the immediate future. Most hospital purchases for new X-ray equipment are gravitating toward DR, especially now that DR detectors have become more portable, wireless, lighter in weight, and less expensive. New purchases are focused on rooms that accommodate both DR and CR instead of sophisticated fixed DR detector rooms. However, the majority of hospitals unquestionably are continuing their use of existing CR and converting to DR in steps. While DR offers many workflow improvements, some in the industry still see a few specialized areas in which CR may be the better choice. Fernandes says that long-length imaging still presents a challenge for DR because of its standard-sized detectors, unlike CR cassettes that are available in various lengths with multiple plates. Manufacturers have been trying to address this problem, and most expect that customers will have access to a wider range of DR detector sizes in the years ahead. Looking at recent National Electrical Manufacturers Association market trends, hospitals with 250 beds or more appear to be buying more DR and DR portables than ever before. However, there are many manufacturers from which hospitals can make purchases, and the big-box companies can have an advantage in bundling with other larger-scale needs, particularly in new builds. “Currently, due to the significantly higher implied costs of DR, it would seem that more of the nonhospital market is looking at CR and maybe the cordless flat panel,” Fabrizio says. “The DR flat-panel market is now becoming very competitive. It’s great for the hospitals but not so great for manufacturer’s profits.” That’s why most original equipment manufacturers have looked to new ways of balancing competitive selling prices with lower manufacturing costs. To counteract the problem, Fabrizio says Fujifilm is further complementing its capture technologies with a wide range of imaging solutions (eg, complete DR rooms, retrofit room and portables integration, complete portables) to provide a complete solution with one consistent workstation user interface and advanced applications such as stitching and linear tomography. Also, as hospitals face reimbursement cuts and steep financial challenges moving forward, many have undergone steps to minimize cost, which has meant slower adoption of DR updates, Fabrizio says. The initial impact of the health care reforms combined with the sluggish economy have dramatically stifled spending for the general X-ray market. It’s common for equipment to be utilized well beyond its expected life, with more organizations holding out until the equipment can no longer be used. Some observers note that as customer budgets began to show signs of easing, 2013 brought the new 2.3% medical device tax and $800 million in reimbursement imaging cuts. Subsequently, cost will remain a driving factor regarding DR purchases.